A number of migrants arriving in Turkey hoping to reach Europe are purchasing fake Syrian passports in order to claim asylum at the end of their journey, the head of the European border management agency Frontex told French radio today. Syrian citizens are legally entitled to refugee status in any European country because of the civil war in their country. Those using fake passports, Leggeri said, are mainly from North Africa or the Middle East, migrating for economic reasons. But he admitted that authorities do not have a complete picture of those migrating to Europe. "We have an idea of nationalities but we don't have full profiles," Leggeri said. Asked by the radio host whether terrorists could be reaching Europe, Leggeri said "it is not impossible but we are extremely vigilant." Overall, the number of illegal crossings at European borders since January has gone up 175 percent, according to Frontex, reaching an estimate number of 340,000 individuals arriving in the European Union. The number only reflects people who are being registered, Leggeri said, adding that not all migrants are being registered because of the volume. About 88,200 of those making their way to the E.U. 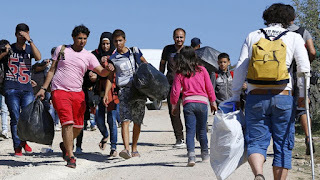 are Syrians, according to the latest International Organization for Migration figures, which is more than the next four countries of origin put together. The Hungarian Interior Ministry said today that around 142,000 people had requested asylum in Hungary, including 45,000 migrants from Syria. In Macedonia, about 1,500 migrants are waiting to cross the border and head north toward to Germany, Austria and Scandinavian countries. To deal with this ongoing humanitarian crisis, the head of Frontex said Europe urgently needs more border patrol officers, especially in the Greek islands.